"We pair lemongrass with some limes to concoct this vibrant smasher of a drink. Make the day before you need, as it has to steep overnight." 1. Place the lemongrass and mineral water in a large saucepan over a medium heat. Bring to a rolling boil, then reduce to a simmer for 60 minutes. 2. Remove from the heat and add the coconut sugar, lime juice and lime peel. Stir well, then leave to cool. Cover and put in the fridge overnight to steep. 3. The next day, strain the lemonade into a jug or bottle and keep refrigerated. 4. 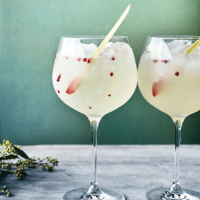 To serve, pour into large copa or balloon glasses with plenty of crushed ice, garnished with pink peppercorns and lemongrass stalks.